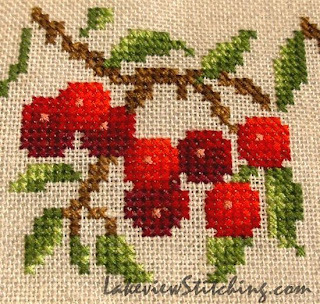 Lakeview Stitching: Juin - Almost Finished! It is hard to believe that my last post on this project was in February, but I finally have just a few more odds and ends to finish up on my "Juin" (June) sampler from Bonheur des Dames. It has been a long time coming, given that I started it in 2004! It was packed away for many years, but I took it out again in early 2011 as part of a big push to clear up some UFOs. So it has still been over a year of on-and-off work. The close up photo is a little misleading - this is 32-count linen. It was fun though! No colour changes, it used one strand each of medium and dark green blended in the needle. good on you working on your UFO`s32ct is very fine, I cannot manage smaller than 28 now and it has to be white or pale colours, eyes like the body are not getting any younger! Thanks, Margaret! I have been finding that everything is easier to work now that I have taken it all out of the frame. The non-working hand (in my case, my left hand), can help to guide the needle under the fabric, so it is much easier to come up in the right place. Great stitching. It's looking good. I am currently working on 32 count for the Toy Chest Etui. It's only possible for me because I am using clip-on magnifiers over my reading glasses. That's a nice project too, Jillian. There are lots of fun things there! I'm looking forward to seeing all the bits and pieces as they develop.